Shalakya Tantra is the branch of Ayurveda which deals with ailments above the neck. Sreedhareeyam specializes in Shalakya Tantra, and especially Netra Ckitsa (Treatment of Eye Diseases) aided by the extensive knowledge that was handed down in the family through centuries and polished with clinical experience. All the doctors here are professionally qualified, but at the same time, enriched with the traditional collection of knowledge scriptures in Nellikkattu Mana. All the medicines and treatment methods are constantly evaluated by the continuous research and clinical study centres, which subsequently perfected the methods in use. The treatments taken are decided after identifying the diseases in the traditional way and at the same time confirmed with most modern diagnostic equipment. This reduces over-dependency on a particular system in use and results in unparalleled success in treating common and rare diseases at the same time. There are special treatment procedures as prescribed in Shalakya Tantra for the treatment of the organs of head and neck. They include Nasyam, Dhoomapanam, Gandoosham, Kabalam, Shirodhara, Shirovasthi, Anjanam, Tharpanam, Pratisaranam etc. 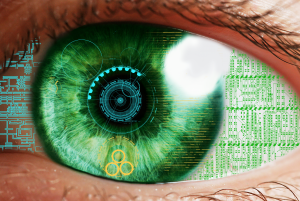 Ayurvedic ophthalmology is seen to be highly effective in many degenerative ailments as well as infectious diseases. 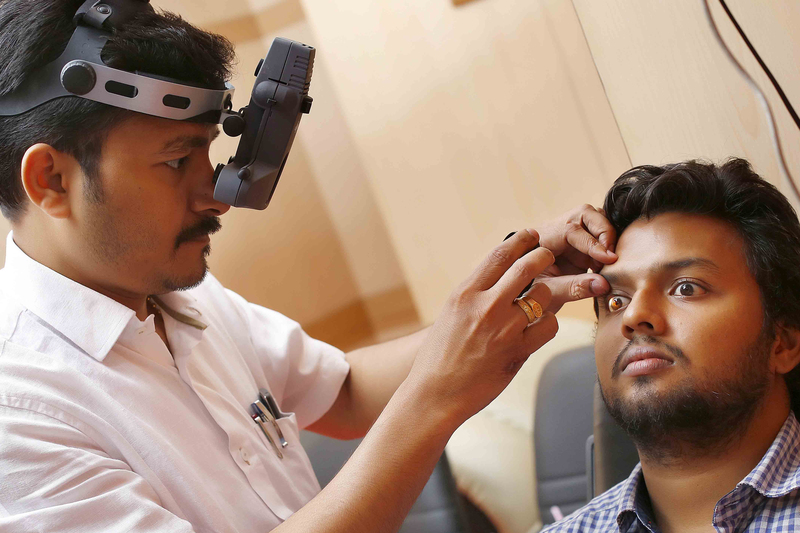 There are several methods advised in the classical textbooks of Ayurveda regarding proper care and prophylactic measurements for eyes. The Ayurvedic texts of Sushrut Samhita, Charak Samhita and Ashtang Hruday have given a detailed description of shalakya tantra. It offers a detailed study of aetiology, diagnosis, prevention and treatment of diseases that affect organs above the neck. According to the texts, there are about 76 diseases pertaining to the eyes, whereas the ears are prone to 25 different kinds of ailments. The nose can be affected by as many as 18 diseases, while the lips are easily susceptible to 11 types of diseases. Shalakya tantra finds a remedy for all such diseases. Shalakya Tantra is not only concerned with the immediate treatment of the ailments but also with the follow-up treatment, in order to ensure that the disease is uprooted and eliminated. Therefore, it proves to be one of the most effective methods of treating the ailments related to the upper portion of the body, above the neck. 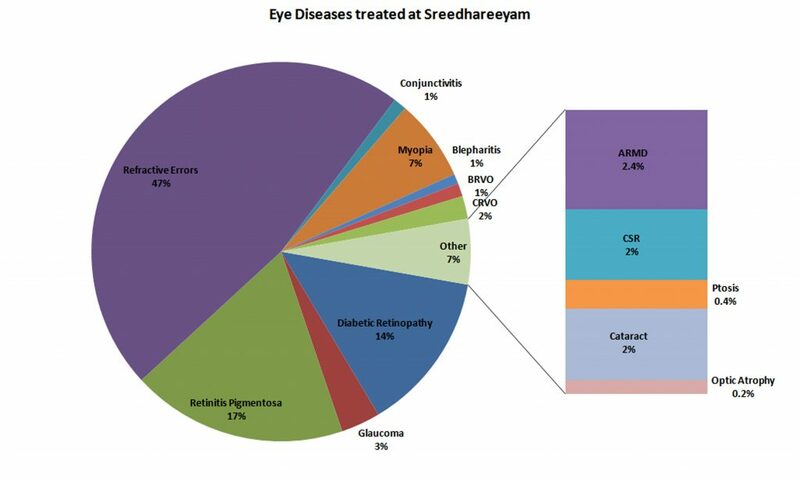 The whole spectrum of eye-diseases is treated at Sreedhareeyam. All the 72 eye diseases mentioned in Ayurveda are treated here. They include the diseases that affect the Cornea, Eyelids, Optic nerves and the Retina. Every Year Sreedhareeyam treats about 52,000 Out-patients and around 4800 In-patients. Retinitis Pigmentosa is a Vision Threatening, Blindness causing, Progressive, Age independent, Day and Night (Light) dependent, Degenerative, Bilateral, Eye Rod affecting, Autosomal recessive and/ or Sporadic natured, night blindness featured Kaphajatimira, Sannipata (tridosha) disease, which is under the broad domain of diffuse Retinal Dystrophy as the central area of retina, Macula gets affected. The progressive degeneration occurs because of the loss or death of rods and cones (photoreceptor cells where rods are affected more than cones) of the retina, which eventually affect the retina’s ability to respond to light. It is a fundus disorder, where the visual field changes show annular or ring-shaped scotoma which is a typical feature that corresponds to the degenerated equatorial zone of the retina. The retina is the innermost, the light-sensitive layer of the eye where the visual image of the world is created by eye optics. In the initial stages, the night vision and peripheral vision will get affected, followed by dark adaption and Tunnel Vision. In the later stages, when cones and macula are affected, they affect the perception of colour and the central (reading) vision will be blemished. Refractive error occurs when the eye fails to correct the focus rays of light from an object onto the retinal plane and hence, causing the perception of the blurred image. These are very common in all age groups, from all backgrounds of society. These errors are neither preventable nor neglect-able. They have to be corrected, usually using spectacles or lens. But, proper correction measures are required, where Ayurveda assures a safe and stable solution for the majority of the cases. Very common Refractive errors are 1. Myopia (short or near-sightedness), 2. Hyperopia (long or far-sightedness), 3. Presbyopia (age-related loss of near focusing) and 4. Astigmatism (irregularly curved cornea). The problem can be rectified totally in the early ages and can be well managed in the later ages using ancient Ayurvedic treatment protocols, eye exercises and Yoga. Surgery can be avoided. It is a progressive, degenerative, central vision affecting, blurriness causing eye disease, which is prevalent in the middle age. Black spots may develop, affecting the sharpness of central vision. The brightness of the object cannot be recognized perfectly. ARMD, with its advancement, interrupts even simple daily activities and badly ceases our ability to read, write, drive, cook, identify faces, fix up the articles, handle workshop tasks, etc. Age factors, lifestyle disorders, profession, stress, family history are the primary causative factors of ARMD. Ayurveda proves its uniqueness to manage this condition very effectively. A healthy diet, adequate exercise and systematic lifestyle adds up for the speedy recovery. Even, Ayurveda also emphasizes the importance of the above factors. All the types of Glaucoma are devastating, irreversible and pathetic conditions, where the damage occurs to the optic nerves, which carry the information from eye to brain. The disease mainly depends on the Intraocular Pressure (IOP) within the eye. It is a silent disease, with no specific symptoms for easier and earlier diagnosis. Initially, it affects the Peripheral vision and may even lead to vision loss in the later stages. In the majority of the cases, ocular hypertension has been a prevalent causative factor. The control of the outflow of the watery fluid (aqueous) that is continually being produced inside the eye has to be monitored and regulated properly to treat and manage the disease. Earlier we respond, better the relief. Ayurveda has an adequate number of examples with satisfactory progress rate in treating the challenging Glaucoma. Diabetic retinopathy, also referred to as Diabetic eye disease is a clinical, progressive, degenerative, vision-threatening ophthalmological condition where the small blood vessels and neurons in retina get affected and finally the situation becomes so adverse that retina damages. Means, it has become one of the prominent or predominant reasons for making the life dark to people, by causing permanent blindness. In DR, the risk to type 1diabetes patients is more than to that of type 2 cases. There are two stages in the condition, DR. The initial stage is silent symptom stage that records even full vision (20/20), which is termed as Non-Proliferative Diabetic Retinopathy (NPDR). The advanced stage is Proliferative Diabetic Retinopathy (PDR), where the newly formed abnormal, fragile blood vessels at the hind part burst and bleed at any instant, causing the blurredness of vision. Both of the clinical conditions are effectively addressed by Ayurveda with its systematic treatment procedures. This is often referred to as Optic Atrophy, which is a clinical condition that is caused due to the damage of Optic Nerves. The damage may be because of insufficient blood flow to optic nerve, swollen optic disc, inflammation of optic nerve, tumors, infections, direct or indirect injuries, direct exposure to sunlight, any trauma to head, genetic mutations in mitochondrial DNA, alcoholic beverages, tobacco usage, vitamin deficiency, malnutrition, methanol detoxication, hereditary, etc. The most probable and common signs are visual field defect, abnormal papillary response, inability to perceive colours and ultimately vision loss. A proper knowledge of Ayurveda is sound enough to keep a check to all the evil factors that affect the vision in the condition of Optic Neuropathy. Uveal layer or Uveal coat or Vascular layer is the pigmented, middle layer of the three concentric layers that form an eye. Uvea is divided into Iris, Ciliary body and Choroid; with functions of nutrition and gas exchange, light absorption, secretion of aqueous humour, control of focus, optimization of retinal illumination, etc. Painful Uveitis is caused by the inflammation of Uvea. It is associated with heat, redness, pain and swelling on one or two eyes. Non- infectious Uveitis is usually an autoimmune disorder. Diseases like AIDS, Behcet’s Syndrome, Shingles, Multiple Sclerosis, Psoriatic Arthritis, Rheumatoid Arthritis, Sarcoidosis, TB, Ulcerative colitis, Crohn’s disease, etc aggravates Uveitis. Sometimes, it may be caused because of bacterial/ viral infection in the eye. The major symptoms are change in vision, floaters, eye pain, eye redness, light sensitivity, swelling, etc. Ayurveda treatment not only cures Uveitis, also nourishes Uvea and improves its function. Keratoconus is a threatening eye disorder that is caused by the progressive thinning of the cornea. It may be because of genetic, environmental or hormone factors. The cornea gets a cone shape, sometimes a scar or circle can be seen within the cornea. In the early stages, the symptoms are similar to that of refractive errors, but the vision deteriorates with the progression of the disease. The notable symptoms include blurry vision, double vision, myopia, astigmatism and light sensitivity. The eye muscles are crucial in the positional alignment and balance management of the eye. Misalignment and imbalance of these muscles cause Squint Eye. Because of poor muscle control, the direction of the sight and focus will not be stable. The focus of two eyes will not be synchronized because of the improper functioning of Extraocular muscles, which control the movement of eyeballs and eyelids. It may affect Binocular Vision. Apart from a muscular problem, improper coordination of brain also induces Squint eye. Early diagnosis and an apt Ayurveda treatment and Yoga help to rectify this condition. If not rectified in the “Critical Period” (early ages below 6years), it may be progressed to Amblyopia condition. Cataract is a slow and surpine phenomenon where the normal, lucid lens of the eye is encompassed with dense clouding. It forms like a fog on the lens; which impairs the normal vision. This interrupts the routine activities like driving, reading, writing, etc. Cataracts may develop because of aging, diabetes, hereditary, past eye surgeries, prolonged steroids, obesity, smoking, alcohol, Hypertension, excessive exposure to sunlight, etc. the condition can be identified by the symptoms like clouded or dim vision, difficulty with vision during night, high sensitivity to light and glare, need of bright light for reading, fading of colors, frequent changes in eye power, double vision in one eye, etc. Ayurveda helps greatly for the proper management of the disease and also prevents the further clouding around the lucid lens. Eales disease, which is also known as Angiopathic Retinae Juvenilis is an idiopathic, ophthalmic disorder that is characterized by inflammation of the retina, blockage of retinal blood vessels, neovascularization, repeated retinal and vitreous haemorrhages, etc. the symptoms are not significant in the early stages. As the disease progresses, one may develop floaters, blurring vision and gross diminution of vision, etc. massive vitreous haemorrhages are present. 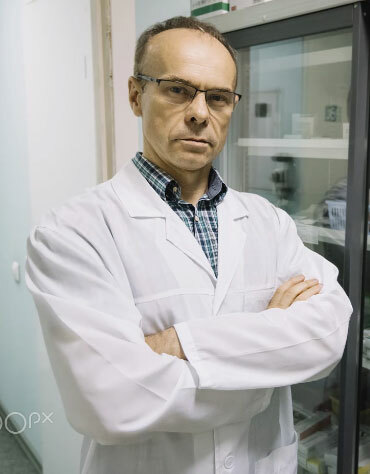 In the majority of the clinical studies, the presence of DNA of bacterium Mycobacterium tuberculosis has been found as the tentative factor of Eales disease.